Simon Athearn is getting creative with his late crop of tomatoes at Morning Glory Farm. Imagine that your vegetable garden is producing dozens, even hundreds of tomatoes late in the season, after all your house guests are gone, your ravenous college kids are back at school, and you’re getting sick of insalata caprese. Now imagine that those hundreds of tomatoes are actually thousands, and that you are a business with a customer base that drops in half at the end of August. You’d have some idea of the tomato predicament Morning Glory Farm faces this year. Morning Glory did not reach its first 100-pound daily field tomato harvest until August 10 this year, five days later than in 2016. The second week in August came and went without significant increases in yields. In fact, by the time the Fair began on August 18, the farm had only harvested 955 pounds of red field tomatoes, as opposed to 2,800 pounds the year before. 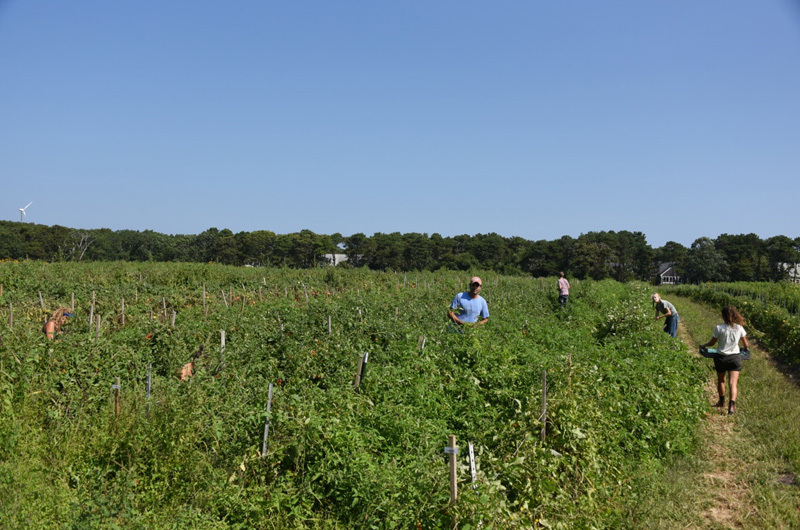 “It was the third week in August before we felt rich in tomatoes,” said Simon Athearn, CEO of the well-known family farm in Edgartown. The 100-pound daily yield is traditionally the way Simon registers lift off. From that point, the yields usually accelerate, going up to 300, 400, even 600 or 800 pounds a day, with 1,000-pound days not unheard of. On August 19 of 2016 — smack dab in the middle of Fair week — the tomato crew, led by manager Lydia Hall, picked 1,133 pounds of red field tomatoes. This year, the first 1,000-pound day came on August 28. Simon keeps detailed records of where every crop is planted, how much is planted, how much it yields, and when it yields. 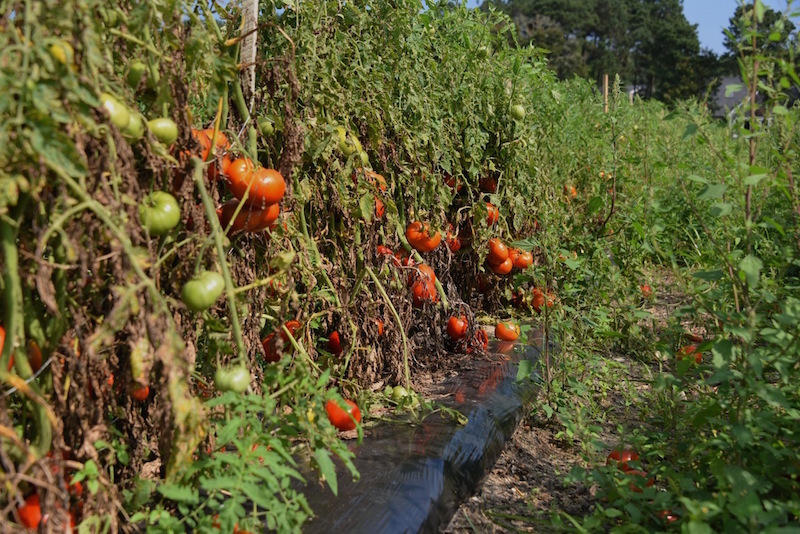 Last year, Morning Glory Farm harvested a total of 42,550 pounds of field tomatoes (all varieties), which does not include 11,000 pounds from the greenhouse. That total was slightly up from 2015, but less than 2014 — in other words, about average. Forty thousand pounds is a lot of tomatoes. And there’s no indication that this year, with 17,000 plants in the ground, will be significantly off — the harvest is just delayed. A wet spring and cool early summer appear to be the reason. 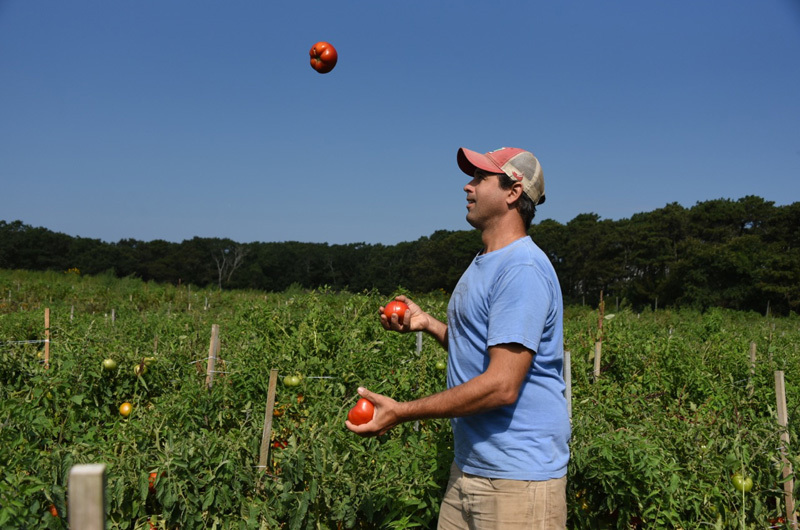 “Temperature, and especially night temperature, really affect tomatoes, but I think the early season cloud cover was a significant factor across the farm,” Simon said. (The corn was late too). There was also a shortage of really hot days, and tomatoes love heat. “But that’s farming,” he admitted. A business like Morning Glory always has to be thinking about contingency plans. One year deer ate the strawberries destined for the strawberry festival. Another year the pumpkin demand outpaced the supply. It’s always something. The solution to this year’s conundrum is, quite literally, tomato sauce. 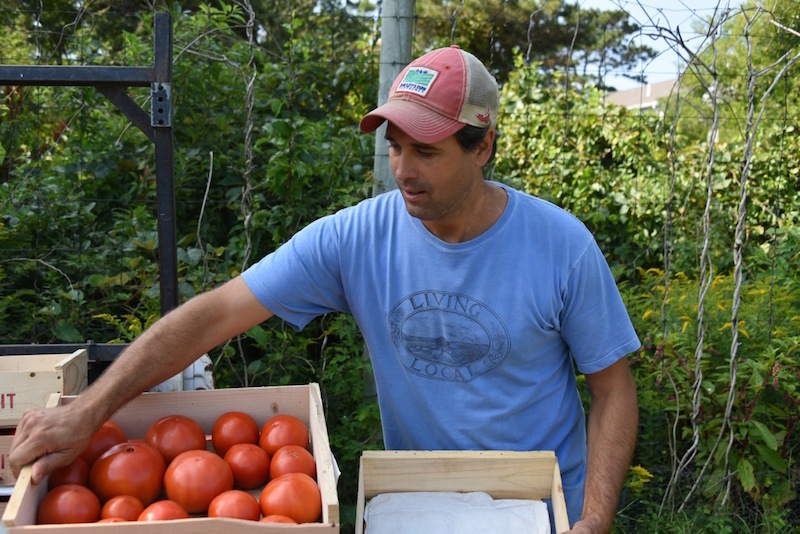 For the first time, Morning Glory has contracted with an organization in Boston called Commonwealth Kitchen that will take the farm’s tomatoes — the first 1,000 pounds went off this week — and return glass jars of both crushed tomatoes and marinara sauce to sell in the store. Commonwealth Kitchen is a nonprofit enterprise that helps food entrepreneurs start or grow a value-added food business. Their mission includes helping to make healthy food more accessible for all. “They’re well-organized with good leadership,” Simon said. Morning Glory had been looking for a partner to help increase their volume of value-added products, but it had to be the right one since they wanted the option of using the farm’s own recipes. Commonwealth seemed like a good fit. Laying the groundwork paid off. 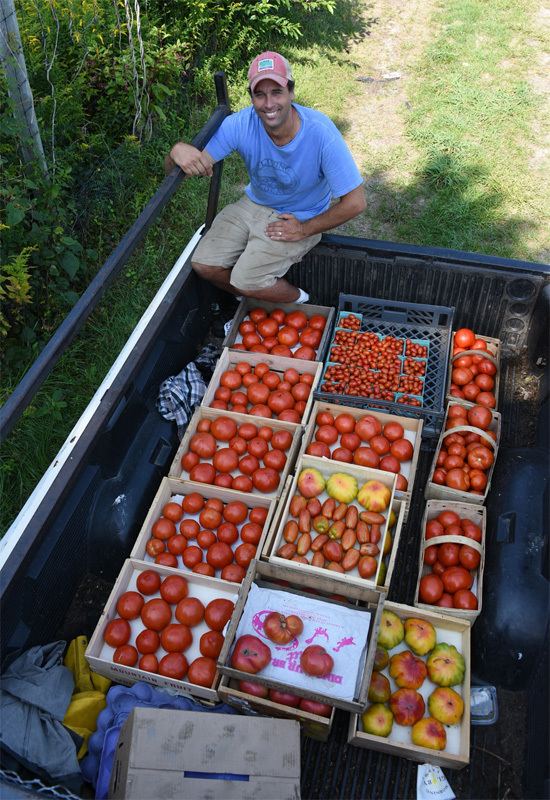 When Simon realized in August that peak tomato harvest was going to miss peak customer volume, he jumped on the phone with Commonwealth and requested extra tomato processings for the fall. “The processing at Commonwealth includes a food-safety check and recipe testing by Cornell. And the jars will also have the interstate commerce label on them,” he said. This will open up more channels of distribution for Morning Glory’s canned products. 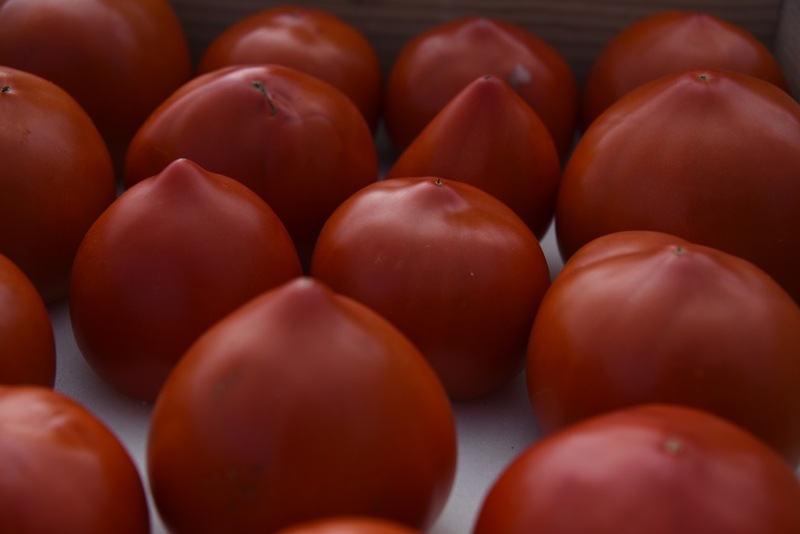 There’s a double silver lining to turning excess tomatoes into value-added products. Customers will now be able to enjoy Morning Glory Farm tomatoes throughout the winter. And the sale of canned tomatoes will help the farm balance out the shortfall from fewer fresh tomato sales in August. Value-added products are essential for farm businesses that want to thrive and grow. As in past years, Morning Glory will also invite the Island Grown Gleaners to pick tomatoes to distribute to the Island’s neediest. And extra tomatoes, especially those that aren’t quite perfect, will make their way into the Morning Glory Farm kitchen, no doubt for soups and stews. It’s reassuring to think that a farm’s plan for making the most of extra tomatoes doesn’t look too different from what you might do at home: Share a little, cook a little, and make a whole lot of sauce. At Morning Glory Farm, there are four significant tomato plantings. “We start the first planting in my mom’s dining room, where it’s warm,” Simon Athearn says. “Then in early January they get transplanted into two soil-managed organically grown green houses with full heating. They have both underground radiant hot-water heat for the soil and propane heat for the air. The hot water heat uses the spoils of electricity from the farm’s windmill and solar.” It’s efficient, and since tomato plants like warm roots, “Those pipes have really made a difference.” The Athearns built one 2,700 square-foot double-skinned greenhouse 15 years ago and added a second one this past winter. The next planting is the main crop — about 90 per cent — of field tomatoes. (This includes red slicers, cherry tomatoes, plum tomatoes and heirloom varieties.) “We plant those when we feel it’s frost-free, usually in the third week of May or so. We don’t like to push it with tomatoes. We feel that if they get planted out with cool nights, it slows their total growth,” Simon says. About three weeks later, the last ten per cent go in. This planting is designed to provide a crop that peaks in September. Go Simon and the whole gang at MGF! I find it so reassuring to know that we have (many) forward thinking, think out of the box, local farmers. Thank you for your inspiring work, and for providing so much delicious healthy local food for the island. The summer wasn't quite right without Morning Glory tomatoes in mid-August. That is a hugely impressive story. That is an enormous amount of work in a very valuable area of human consciousness- feeding the tribe. Congratulations on achieving what you set out to do. I was reminded of Charlie Marinelli and Andrew Woodruff, and the rhyme of farming history.